It’s hard to believe that 2019 is right around the corner. But before you know it, all the changes of a new year will be upon us. In today’s instantly interconnected world, communication will be more important than ever. No matter the subject, innovative PowerPoint presentations are a must to carry your message to an audience. The article will address design challenges for 2019 for PowerPoint. 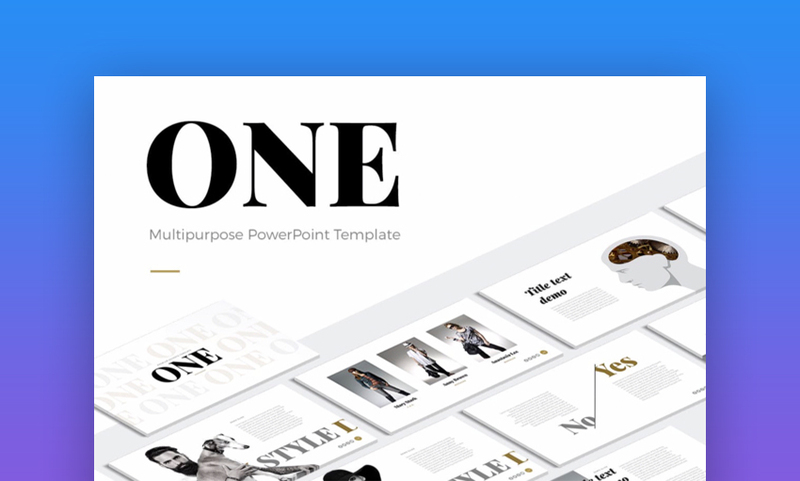 In this round-up, we’re going to focus on 20 of the best modern, trendy PowerPoint template designs that are perfect for your presentations in 2019. Each one helps you project a cool and professional image to your audience—before you ever say a word. The trick is to use trendy, modern PowerPoint slide design templates.Memorable and effective PowerPoint presentations are truly multisensory—it’s not just what the audience hears, but what they see. In other words, you might have the best message ever, but if it looks bad, audiences may judge harshly or even forget what you had to say. Another fundamental truth is the constant hustle and bustle of modern life.Most of us don’t have the time, resources, or skillset to build new PowerPoint slide designs from scratch. 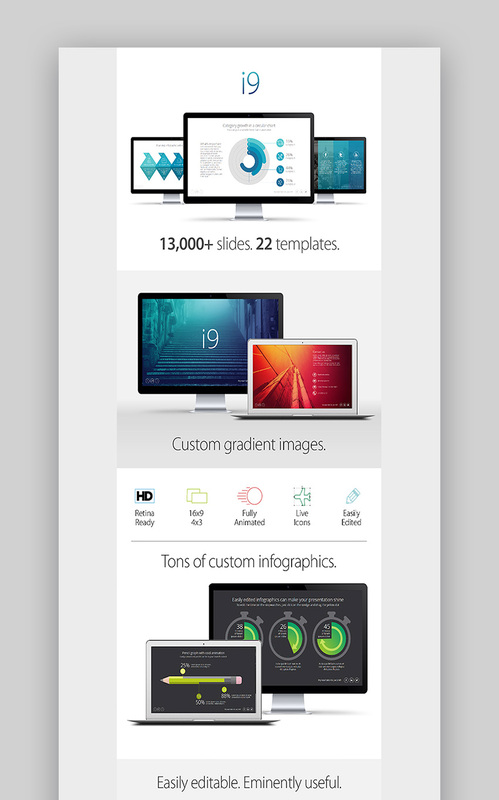 That’s why it pays to use stunning pre-built templates from Envato. They take the hard work out of building presentations. All you’ve got to do is choose one that fits your message and style, drop in your content, and give an epic presentation. Imagine that you’re presenting research findings to your college class. Or suppose you’re a corporate executive pitching a concept in search of funding. No matter what you’re presenting about, and who you’re presenting to, the goal is really the same: persuasion. Through making a favorable impression, you’re seeking understanding, approval, and agreement with your pitch. 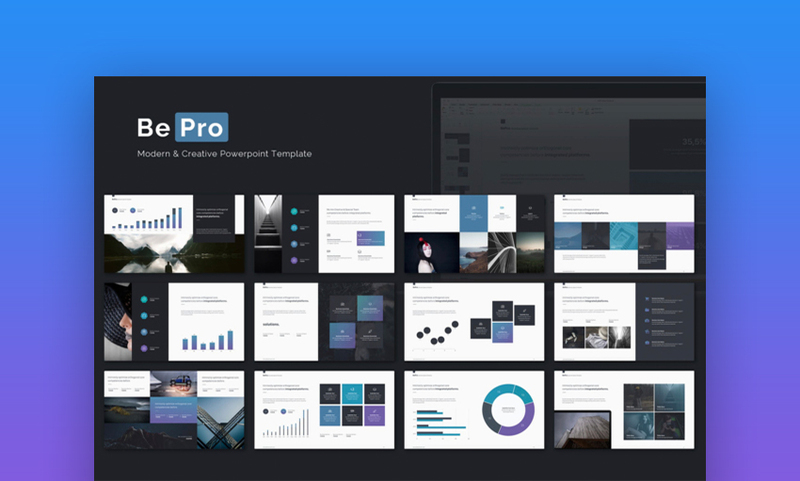 By using pre-built PowerPoint slide design templates, you can leave styling to the professionals and have more time to focus on your message. 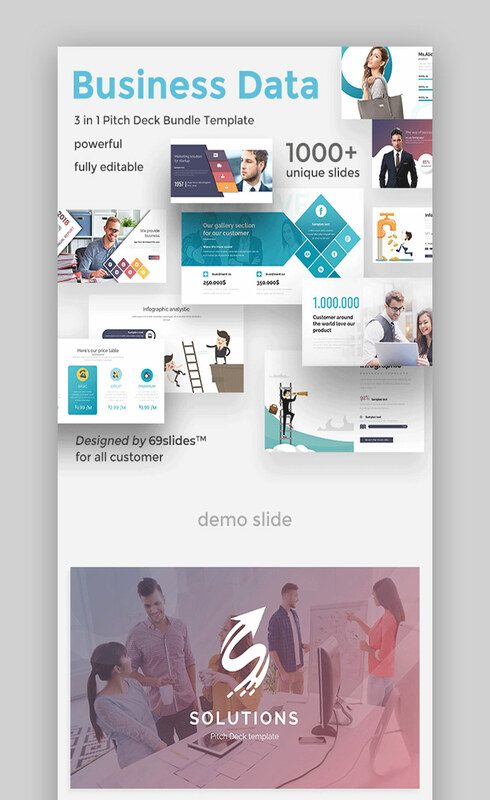 My favorite source for modern PowerPoint templates in 2019 is Envato Elements. Elements provides an incredible all-you-can-download resource for creatives, with a low monthly fee. 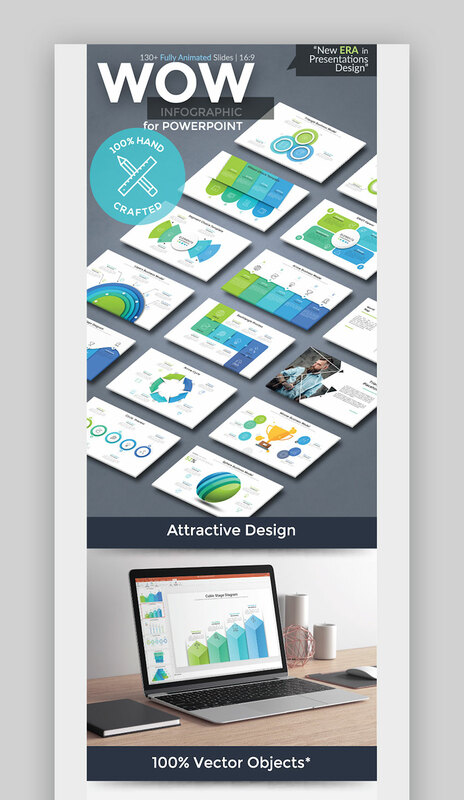 You’ll find presentation templates, stock images, fonts, graphics, and more. When I’m choosing a template for my own projects, it’s key to find one that offers a lot of creative flexibility. Evolution is a prime example. This sleek, modern PowerPoint design is geared toward those building a comprehensive slide deck in 2019. With a vast assortment of layouts, color options, and content placeholders, your work will become really simple. Simply download the template and insert your own content, and this professional template from Elements does the hard work for you. Nothing speaks to timeless elegance quite like the style of classic newsprint. Black and white colors provide stunning contrasts, with vivid images to illustrate the story. 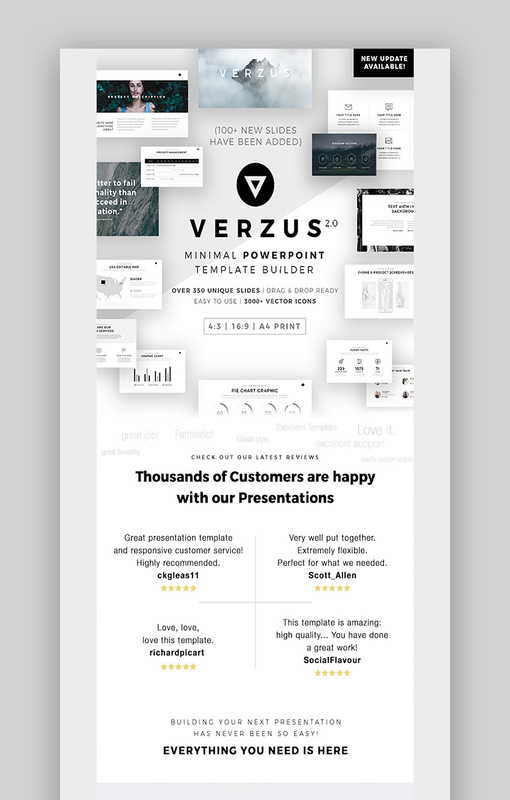 This vibe is captured perfectly by the ONE PowerPoint template from Elements. 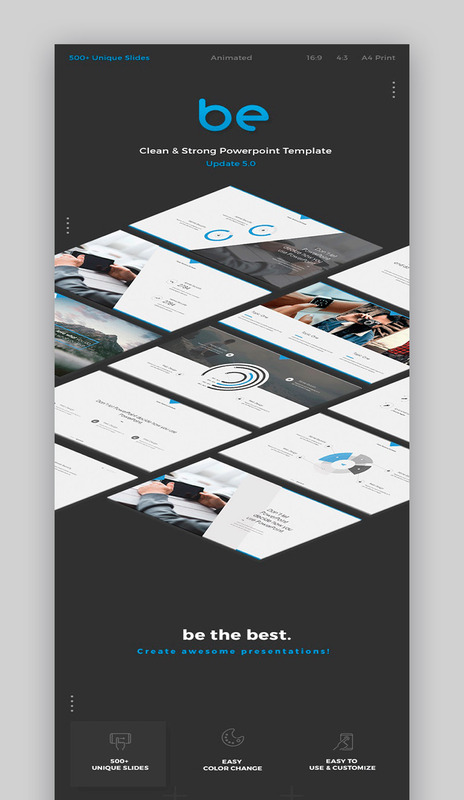 This slide design template also includes all the modern touches you’re looking for, with placeholders for photos, video, and a collection of charts and graphs. Although it’s almost 2019, some things never go out of fashion, a fact captured perfectly right here. 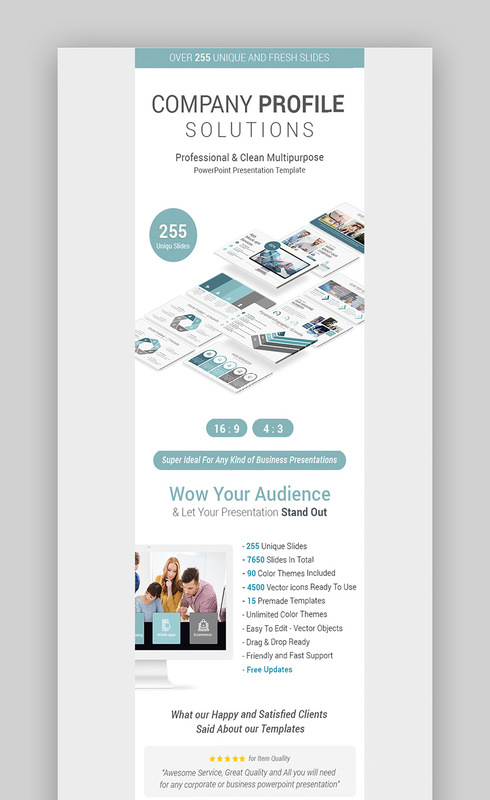 BePro is the perfect starting point for anyone looking to build a cool, professional presentation design for their business. It includes all kinds of content placeholders built around stunning visualizations of data. Simply drop in your text, numbers, images, and graphics, and feel confident that your business is getting the portrayal it deserves. This PowerPoint slide design themes stands out for pastel colors and graphics inspired by the natural environment. 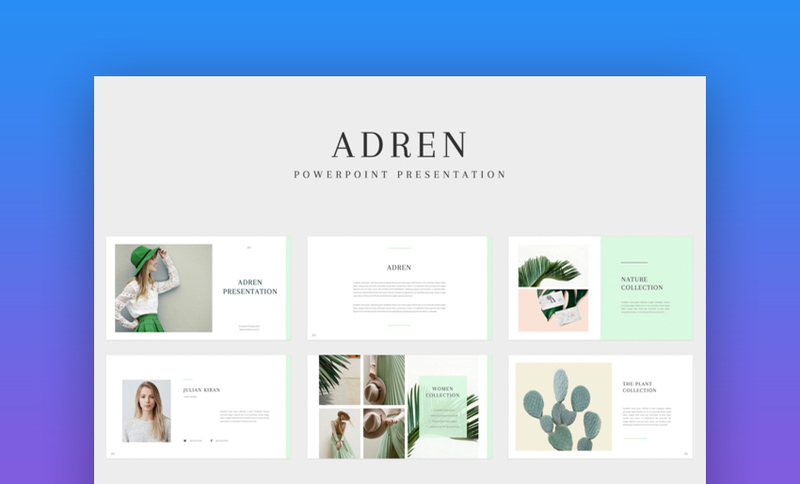 Similar in styling to a modern magazine, Adren allows you to envelop your PowerPoint slides in the true essence of style. Don’t forget to check out the many slide layouts and animation options included to bring additional customization to your presentation. 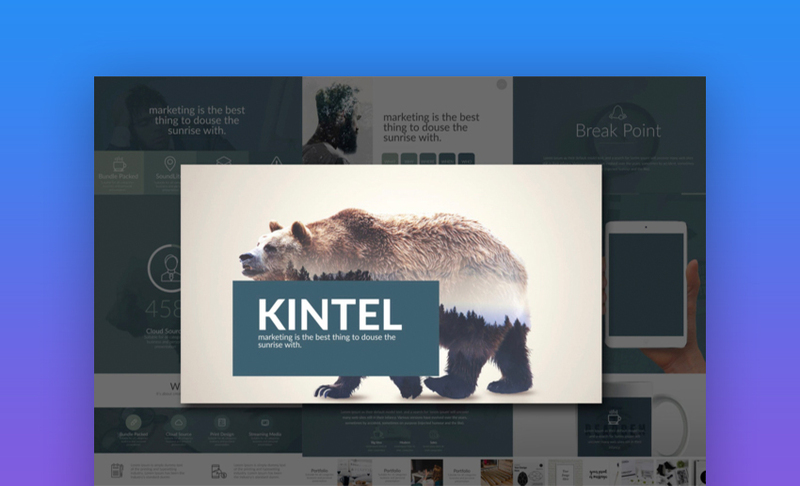 With its unforgettable styling and bold fonts, Kintel is a top design PowerPoint theme for 2019. The vibe is modern, yet rustic—this one is perfectly suited for showcasing art and all of your other graphic design work. Motagua is the ultimate in multipurpose templates, with over 40,000 slide designs included. It also includes a ton of chart and graph examples, and is perfect for data-driven presentations. Choose between dark and light themes and dozens of color palettes to add even more variety to your presentation in 2019. This template is the perfect choice if you want to keep your styling clean and simple. It’s built in the minimalistic tradition to make your text pop. Optional bold color flashes bring emphasis to the many pre-built content placeholders. Verzus is another great option for clean styling. One thing that sets this template apart is the dark theme—a somewhat unusual feature in minimalism-inspired templates. The vibrant contrast this inspires is sure to engage your audience. It’s a frontrunner among favorite new slide designs for 2019. 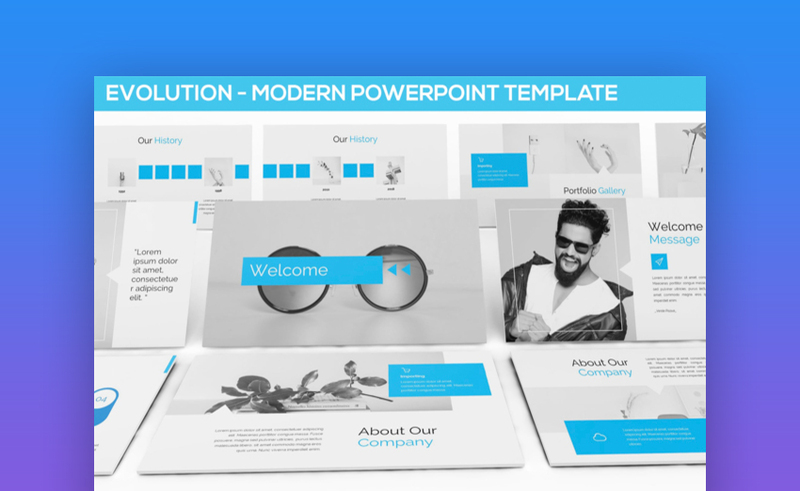 Easily edited and elegantly refined, this modern PowerPoint theme offers over 13,000 custom PowerPoint slides and a vast array of color and image customizations. Idea trees, pyramids, and geographic maps are but a few of the slide designs included here. This one is ideally suited for globally-centered and worldly presentations built around a wide outlook. This corporate-themed PowerPoint template is one of the best choices in this round-up for a proposal pitch deck. Pitch decks are used to pitch big ideas to investors and other interested parties. 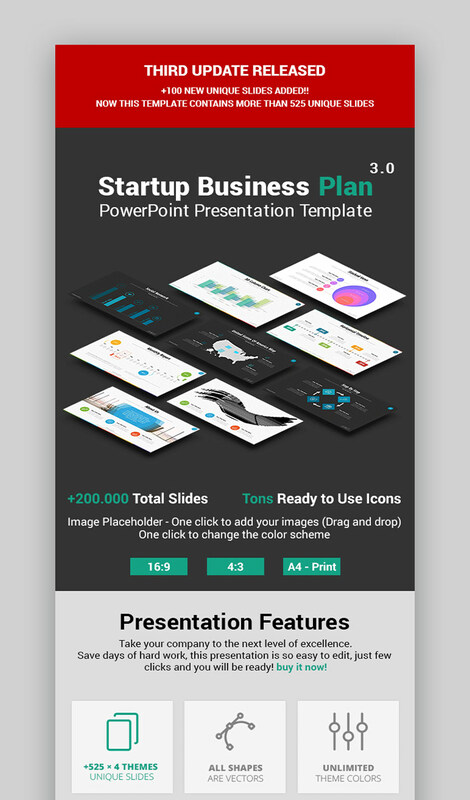 This template includes all the pre-built PPT slides essential to conveying all the vital details about your company in a sleek, professional style. Looking for total customization options, fun animations, and dynamic fonts? 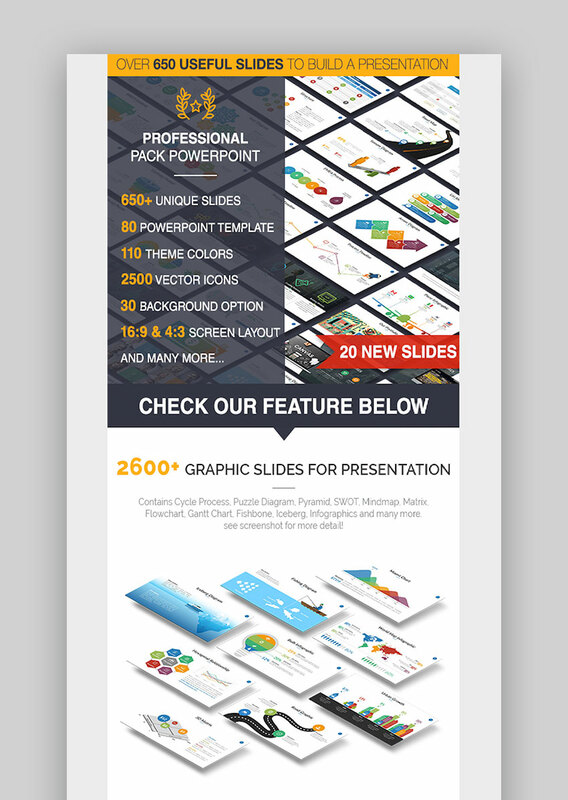 All can be found here, in this vector graphic-driven PowerPoint design theme. There are over 300 slides to choose from to hit just the right notes in your presentation. The high-resolution graphics ensure the presentation looks great, even on 4K and retina displays—ever more common in 2019 and beyond. A corporate profile theme is well-suited for sharing general details about your business. 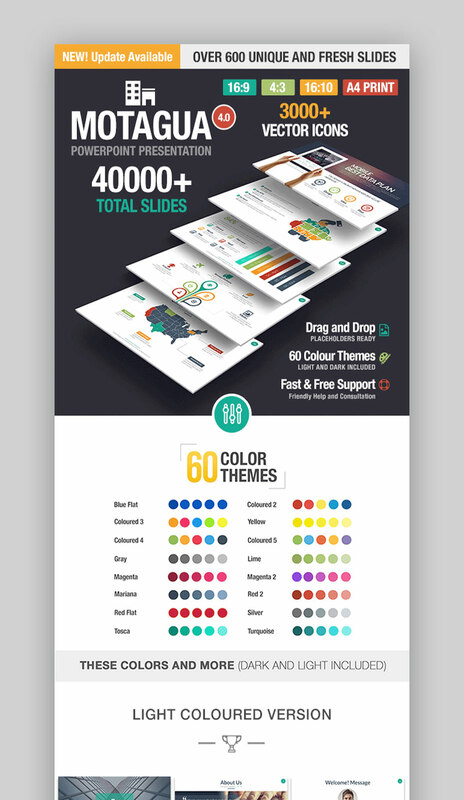 This example encompasses a wide array of organizations with almost 8,000 PowerPoint slides and dozens of color themes. In the modern business environment, it pays to have a profile slide deck ready to roll out in a flash. Build one quickly with this professional theme. Just drop in your content and go. Another prime choice for business pitch decks, this PowerPoint presentation design includes some nifty special features. One example: device mockups. Perfect for app and software developers, these allow you to illustrate your products as they would appear on the screens of computers, tablets, and even watches. Once, such mockups would’ve required considerable creative prowess. Now, you can achieve them in seconds. 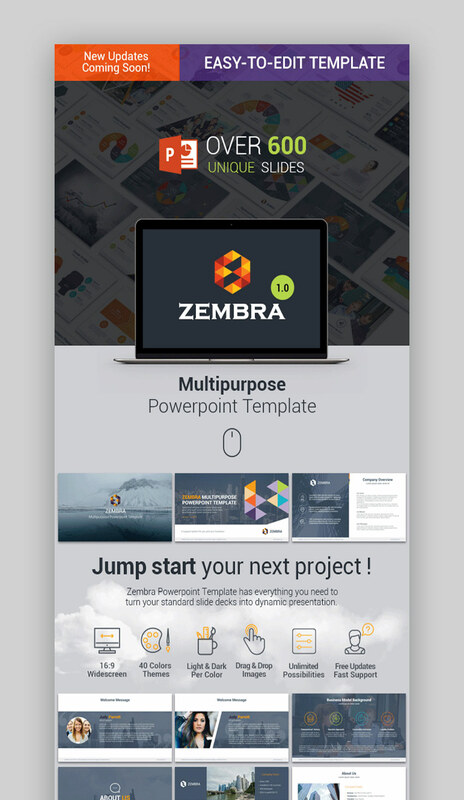 Zembra is an easy catch-all template positioned to suit a variety of circumstances. It includes everything from text-heavy PPT slides to image placeholders, charts, graphs, and more. Even if you’re giving a niche presentation, chances are you’ll find slides here that work for you. Remember to try out the 40 color themes to jazz up your slides even more. The be template is a powerful and inspired evolution from minimalistic whitespace. The style is clean and elegant, but emptiness is filled by an emphasis on imagery. Gradient backgrounds and dynamic custom charts wrap your message in a trendy vibe of modern cool. No time for picking and choosing different slide layouts from many sources? Marketofy is a perfect fix. You’ll find virtually every layout imaginable, with placeholders for every type of content you might present in 2019. All the thematic diversity is boosted by the fact that all elements are fully editable and customizable, making the possibilities truly limitless. 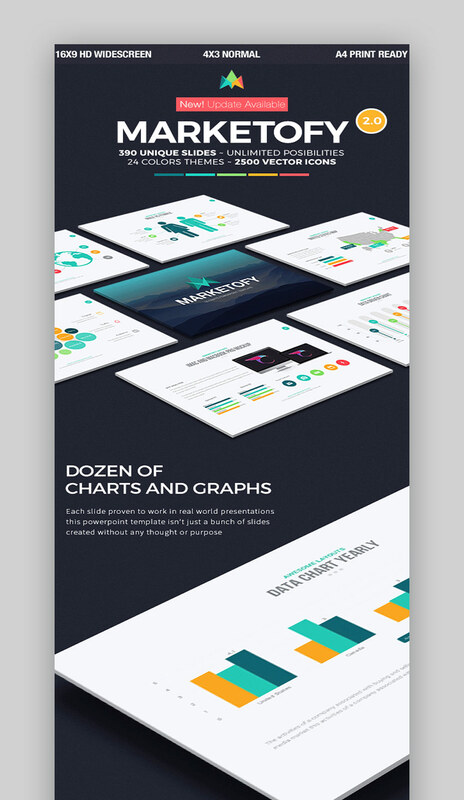 In need of charts, graphics, and a visually-driven layout? Many contemporary, modern charts are included, including Gantt charts, SWOT matrices, and fishbones. Each of these serves as a method of visualizing data and putting it into perspective. It’s time to up your PowerPoint visual-aid game for 2019! This pitch-deck template is geared toward startups and entrepreneurs eager to share their big idea. As a startup, potential investors need to know all they can. Most aren’t willing to invest cash in unfamiliar or poorly explained ventures. It’s up to the founders to convey all relevant details in an honest, open, and modern PowerPoint presentation to get the money flowing. Everything necessary is right here. Drop in your own story and go forth. 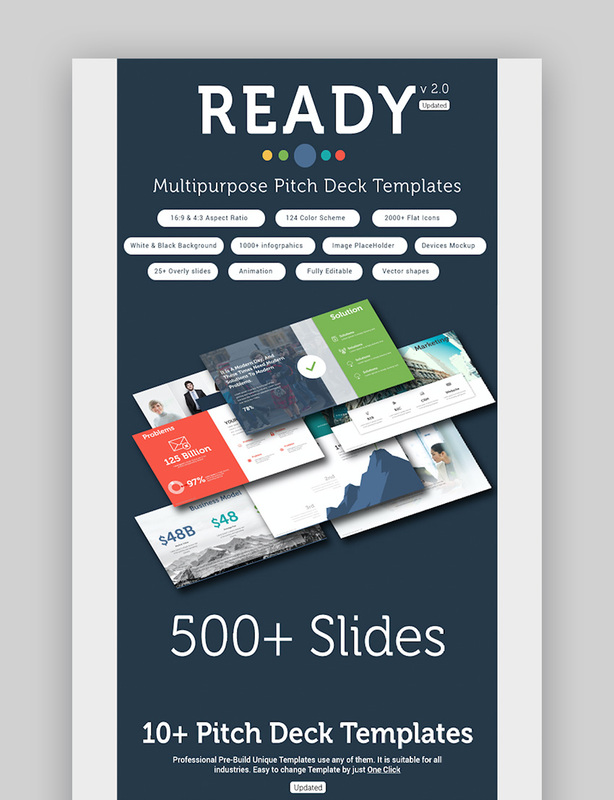 Another solid pitch deck option, Ready is customizable for many uses. Noteworthy are the industry and message-specific pitch deck slide design themes. Included are elevator speeches, problem and solution testimonials, marketing strategies, and competitive analyses. 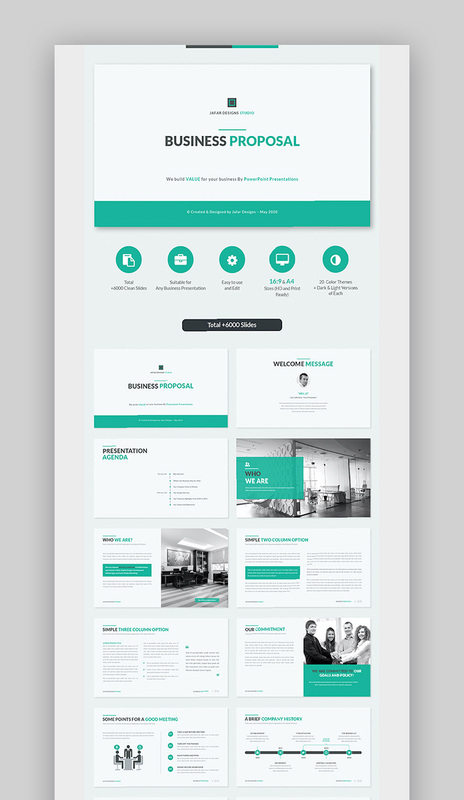 Those make this custom theme ideally suited to business cases far in excess of mere pitch decks. Last but not least, a final PowerPoint template design for 2019 is this 100+ slide theme. 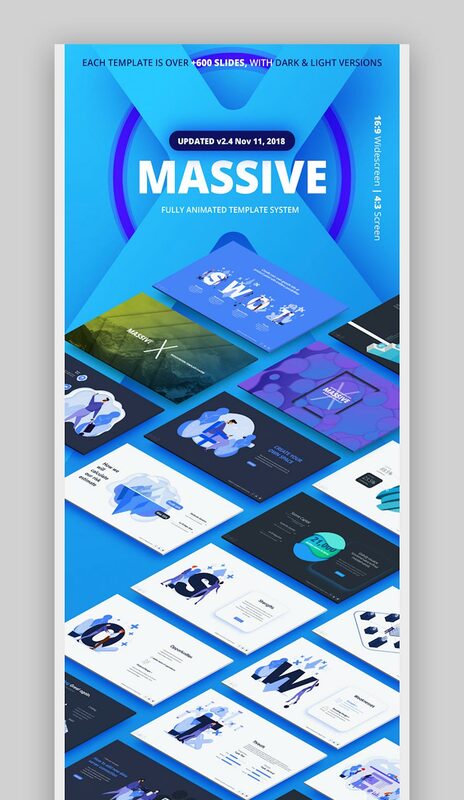 Featuring hundreds of custom icons, engaging animations, and sleek transitions, this pack can meet nearly every need. .PSD files are included if you need edits to exacting specifications.